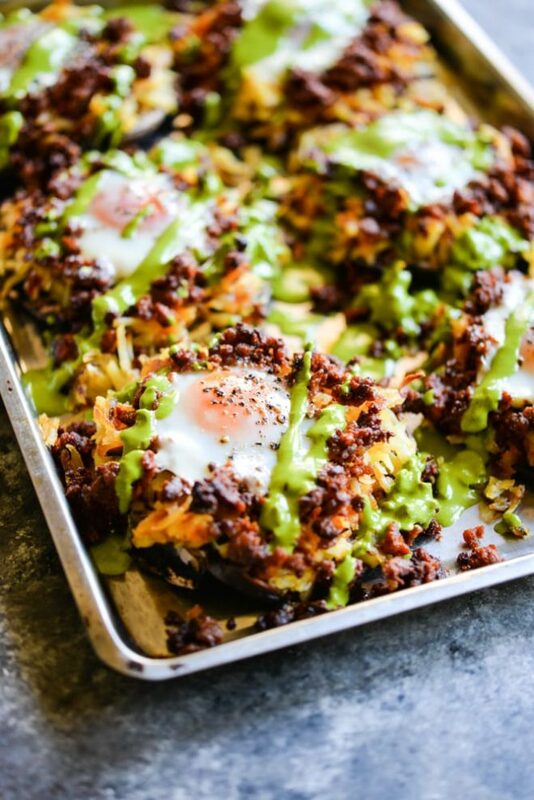 These Chorizo Breakfast Mushroom Caps are a balanced breakfast FLAVOR EXPLOSION. 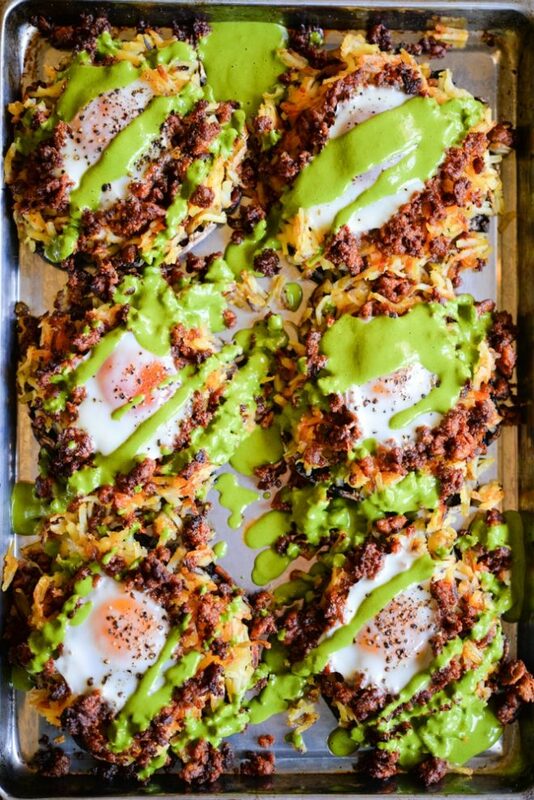 With a mushroom base, crispy hash-brown and chorizo filling, perfectly baked egg, and cilantro lime sauce, this may be one of the most delicious breakfasts to ever come out of my kitchen. Let's talk about breakfast for a hot minute. I feel like my breakfast habits are a bit all over the map, but they always hold true to one thing: TASTY. 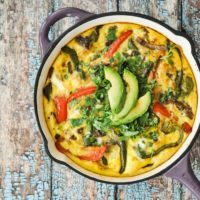 Whether it's a full diner-style breakfast plate with fruit, eggs, bacon, and some greens; a really tasty protein bar + cold brew coffee; or a frittata; I will always prioritize BIG flavors at breakfast time. When it comes to big flavors for breakfast, these Chorizo Breakfast Mushroom Caps are the reigning champs. SO MUCH FLAVOR, I just know you're going to love them. I love that they're each a handy little balanced breakfast in an edible container. You start off with a portobello mushroom that's hollowed out (to make room for more yummies). Then you get to work on the fillings. I grabbed some frozen shredded potatoes and made hash browns, but you can absolutely shred your own fresh. Crisp them up in a pan with LOTS of butter and then fill each cap with a spoonful. From there, brown your chorizo in the same pan (less dishes!). Note that if you can't find or don't like chorizo, you can use any kind of ground breakfast meat! Spoon that chorizo over the hash browns, create a well in each one, and crack an egg. I've found that medium-large eggs fit in the wells without running over. Pop those little cuties in the oven and bake until desired doneness! The last (and optional) step is where the biggest flavor punch comes in. Blend a bit of fresh cilantro with lemon juice, salt, and olive oil for the BEST SAUCE EVER. Drizzle it over the Chorizo Breakfast Mushroom Caps, crack a bit of black pepper, and get ready to enjoy the tastiest breakfast I think I've ever made. If you don't like or can't tolerate eggs, this recipe can EASILY be made without them! Just omit and follow the same instructions as written. Also note, I do think these caps make great leftovers. 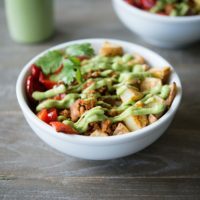 If you're going to meal-prep them and enjoy throughout the week, know that they actually reheat really well. 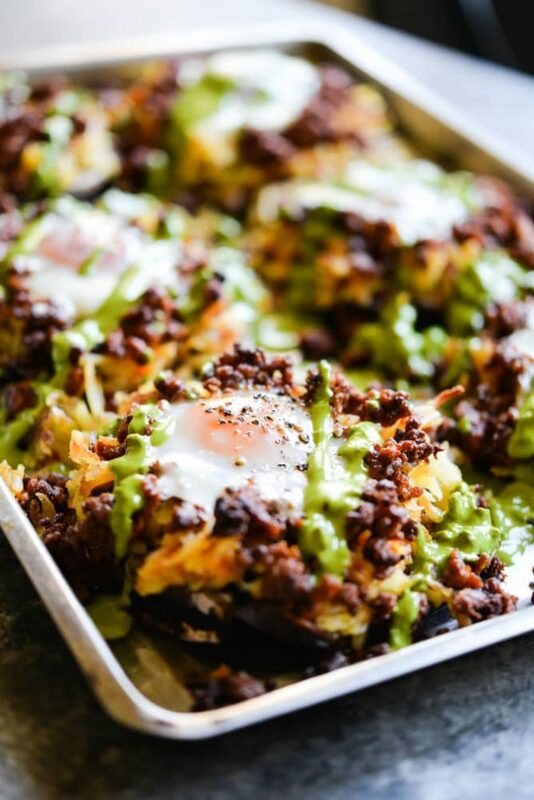 If you too love mushrooms for breakfast, don't miss this Spinach and Portobello Mushroom Breakfast Hash that is amazing as well! Place the cleaned mushroom caps on a rimmed baking sheet. Brush the mushroom caps with 1 tablespoon oil, then season with 1/2 teaspoon sea salt and 1/4 teaspoon pepper, divided evenly amongst the mushrooms. Add the 3 tablespoons ghee or olive oil to a large pan over medium heat, then add hash browns and season with remaining 1/2 teaspoon sea salt and 1/4 teaspoon pepper. Cook 5 to 6 minutes, then flip, and cook an additional 3-4 minutes, or until the potatoes are crispy and cooked through. 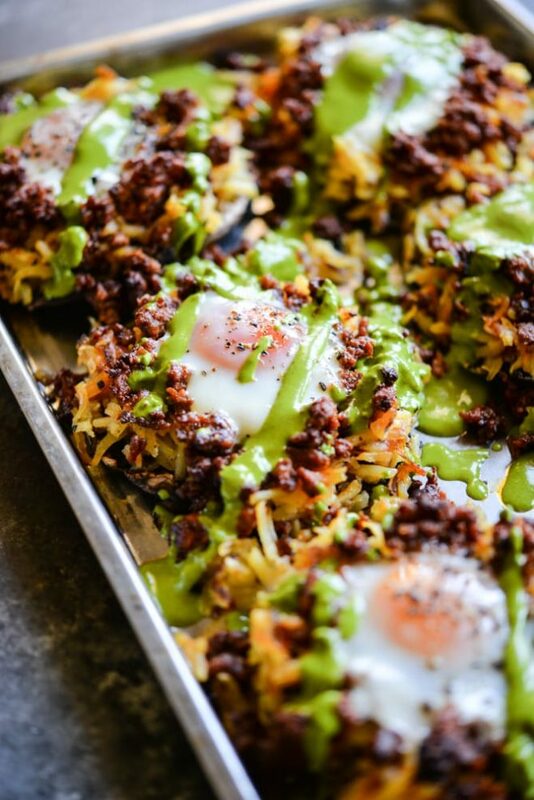 Fill the mushroom caps with the hash browns, then add the chorizo to a large pan over medium heat (you may use the same pan you cooked the hash browns in) and cook for 5-7 minutes until browned, breaking up the mixture into small crumbles as it cooks. Divide the chorizo evenly between the mushroom caps, layering on top of the hash browns. 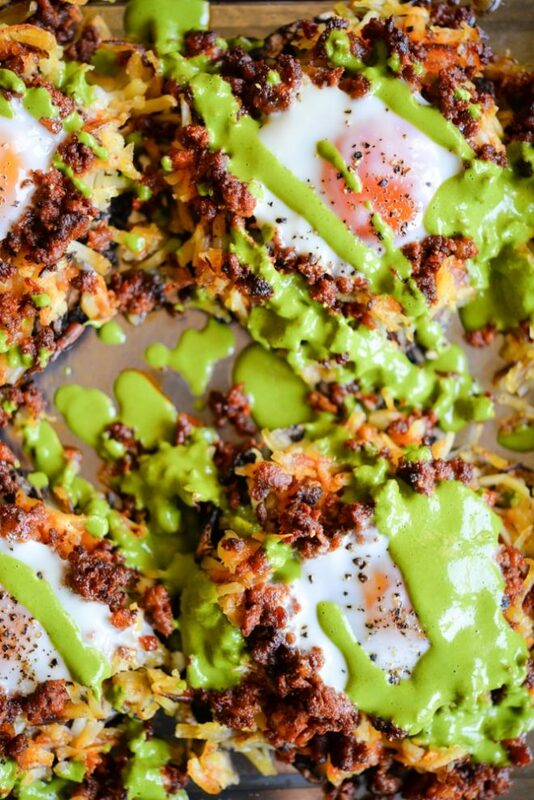 Make a small well in the chorizo and hash browns on each mushroom, then crack an egg. Season with salt and pepper to taste. Bake at 350 for 18 minutes for a runny egg yolk, and 25 minutes for a hard egg yolk. While the mushroom caps are cooking, blend together the cilantro, lemon juice, olive oil, salt, and pepper until smooth. Remove the mushroom caps from the oven, let cool, then drizzle with the cilantro sauce. 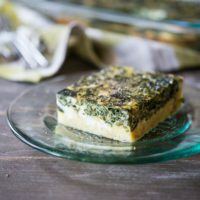 I can’t wait to try your recipe this week! I just bought portobellos today to use for breakfast later this week and then checked your site for your latest post. Boom! 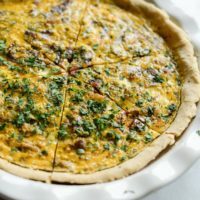 Amazing recipe found! My husband will be so excited. We just love your recipes. So creative and delicious. Thank you! Do you have suggestions for good quality Chorizo?? Typically Cassy gets hers from the meat counter at Whole Foods! I am thinking of making this all the night before and then in the morning cracking in the eggs and sticking in the oven. Do you think I need to change anything up? Everything looks like it would work, but I don’t have much experience with Hash Browns. I think that will work perfectly! The hash browns should re-crisp in the oven.